A collage of interests: Photography, Paris, travel, documenting family history, West Coast-Vancouver, Life issues, people, science, and unique topics. 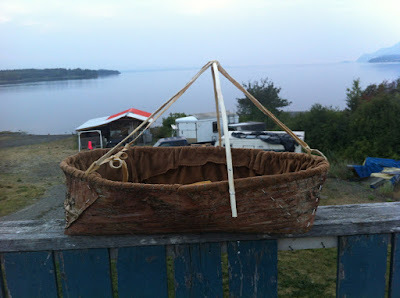 Summer is here, and this blog will be taking a summer hiatus. See you in September. 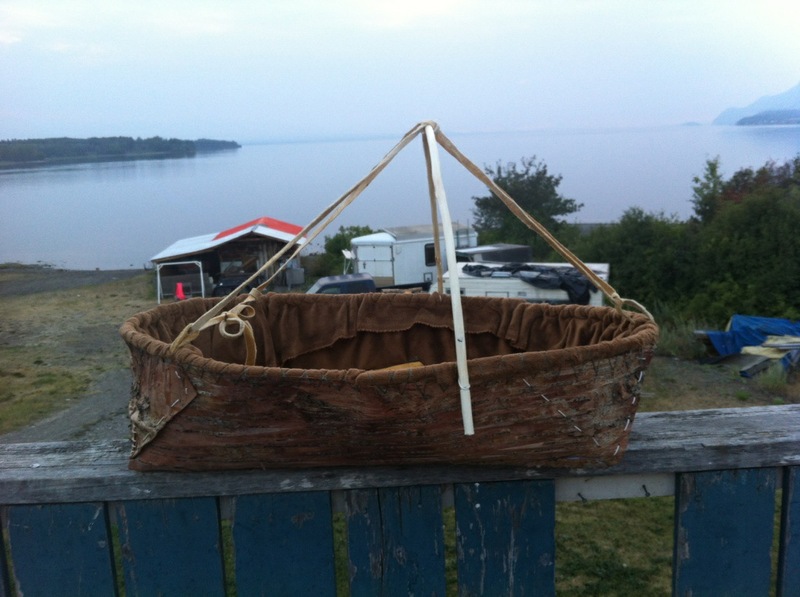 The basket in the photograph was made by a relative. It's one of the traditional crafts kept alive by teaching the skills to ongoing generations. I'm also deciding if this blog needs revamping or a total change or. . .a few other options. I'll be working on my other writing and occasionally visiting other bloggers when time permits. Hope your summer is a good one, however you choose to spend it. 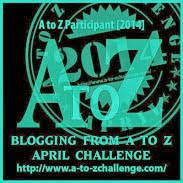 If you would like to check current content please browse the tabs at the top of the blog page. I'll be closing off comments for this post. Italian artifacts from massive sculptures indicate the ancient preference for large art. (Think of the pyramids and gigantic statues from Egyptian history.) The images in this post, taken by friends who visited Italy in 2016, show the beauty of Italian style. Part of a head is all that remains. 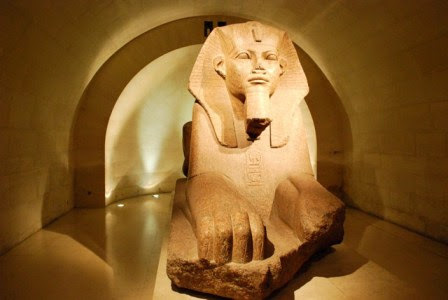 . .
Antiquity statues fascinate us, as we try to imagine the colossal effect of the whole sculpture. Faces look at us from a past long forgotten, remnants of civilizations now crumbled to dust. WE WERE HERE, the sculptures seem to affirm. PS - HAPPY MOTHER'S DAY May 14th, to all Moms!! What catches your eye when you travel - sculpture, architecture, food or the people? What do you think will survive from our time (of current architecture OR current monuments)? Please leave a comment to let me know you were here, and I'll respond. Thanks for dropping by. There may be future Italian image posts, however, I don't have the full information as to where these locations are, as they were taken on a tour in 2016. The images I choose to highlight are for artistic enjoyment, rather than tour information. Please note, this blog is on a slow-blog schedule. Thanks for continuing to read the posts! Christmas 2016 - Happy Holidays! Happy Holidays, Merry Christmas, and Good Luck in the coming year. However you choose to celebrate the ending of another year, may you enjoy it with family and loved ones. Every year, I like to surround myself with my favourite Christmas collectibles, and a few humans too. Most of my collectibles are whimsical, and celebrate the craftiness of the artists who made them. Hope you enjoy the images! Three of thirteen buildings and a carousel are shown, but the town includes a Hot Rod Car Garage, A retro Diner Car, several houses, an old style library, a large barn, an Antique shop, and a Christmas Shop (see below). A small nativity in N scale (model railway size) is in front of the Cathedral on the left. Have you got any special ornaments or other decorations that you like to display at Christmas and through the holidays? Tell me if you collect anything in particular or do you like to keep the decorations to a minimum? Please leave a comment to let me know you were here and I'll respond! Thanks for dropping by throughout the year to read my posts. I appreciate the gift of your time. Let's hope the new year, 2017, is brighter and better for all of us. Natural light helps shape the image as does the shaded areas. Each pear reacts differently to the highlighting. Still life studies have been used by many artists to make an object appear three dimensional in a two dimensional representation (a sketch or painting). Looking from above, we see how the trio of pears vary individually in their response to light, shadow, and the reflection in the window. We see colour in the objects but the reflections show mostly green, like a ghost image. Pears in sunlight. Bartlett Pears. The shading and light which define an object are easy to see. Keep this in mind when photographing any subject. What will be in shadow and what will be in bright light? When the object has light behind it (back-lighting) you may need to use another light source to fill the main subject. In daylight this is occasionally needed. Do you search for objects or location images to photograph? Are you a fast photographer just trying to capture a moment in time, or are you trying to satisfy an artistic urge? Do you take photos with a camera or with your smartphone, or a device other than a camera? Reality: most people nearly always have their phone in hand, but not a camera. . . Please leave a comment to let me know you were here and I'll respond. Thanks for dropping by, posts are updated as time permits. These posts about photography are to help those who like taking images but need a few basics about the composition, lighting and placement of objects, location and various subjects. As August draws to a close and the leaves begin to take on a bit of colour. . . I thought of beaches, since I'm always drawn to water sources, whether river, ocean or lakes, but oceans are my favourites. These images are from my archives. I may have been inspired by a program I saw on the effects of global warming and how that will affect our oceans. What is it about a beach that draws us to it? Is it the sand, or is it the water,with its power of the ocean, and the calmness of the inlets? Is it the sound the wave makes as it slaps the sand and then withdraws, gathering itself for another attempt? Whether you are familiar with east coast or west coast beaches, island beaches, European beaches, there's something about the salty air and the continuous rushing of the waves that invigorates or relaxes, depending on what you do while at the beach. 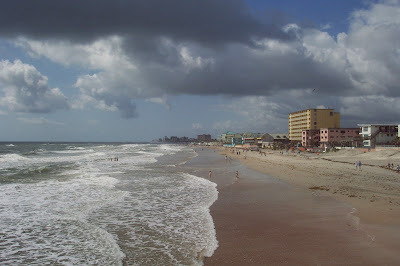 Daytona Beach, Florida, has been popular for decades as it was one beach where auto races used to take place. Cars can still drive on certain areas of the beach. There is a retro boardwalk here as well, which is at the other end of the beach. A city beach, this one is English Bay in Vancouver. The Pacific Northwest has rockier beaches, and there are always logs washed up which are recycled into usefulness on our beaches. We use them to sit on, to put our gear on and to lean against . . .
On the Dry Tortugas, an island park 70 miles off the coast of Key West, Florida, a beach where nothing can be taken as a souvenir, as this is the site of Ft. Jefferson, dating from the 1800s. It has been declared a natural preserve and national park site. You get there via boat, or catamaran. St. Augustine, Florida, one of the oldest settlements in Florida boasts a lighthouse and gorgeous white sand beaches to highlight the quaint town and its fort made of sea shell walls. What beaches do you remember? Did you visit any beaches this summer? Are you sad that summer is winding down? Please leave a comment to let me know you were here and I'll respond. Thanks for dropping by. Apologies for the sparse posts, due to time restraints. Looking out over the Pacific Ocean in California, since the late 1800s, a sentinel stands. . . The Cliff House is a restaurant perched on the cliffs just north of Ocean Beach on the western side of San Francisco, California. It is now part of the Golden Gate National Recreation Area. Don't miss the room-sized camera obscura* on the terrace of the Cliff House. This location embodies the essence of the west coast - the ocean splashing at the shore, sea lions which sun themselves on the rocks below, and great fresh seafood dishes. I ordered Bouillabaisse. The Cliff House looks different now. So does the beach. Nature likes to change the shore with the help of storms and erosion. We were there on one of our trips to San Francisco, California. Adolph Sutro, a local millionaire, philanthropist and later, mayor of San Francisco, lived on his estate at Sutro Heights overlooking the Cliff House. He didn't like what had happened to a once venerable establishment, so he bought the property in 1883 and leased it to someone who could bring it back up to standard and bring back the local families. That also meant to clean out the riff-raff who had slipped in through the cracks. The site seemed doomed when a dynamite explosion occurred, triggered by the schooner, Parallel, which ran aground on January 16, 1887, severely damaging the Cliff House. A chimney fire in 1894 destroyed the recently refurbished property. In 1896, Sutro had the Cliff House rebuilt in the French Chateau style with eight stories, four spires and an observation tower 200 feet above sea level. It wasn't a hotel, but an establishment for elegant dining, dancing and entertainment. In June 1907, the Cliff House was leased and remodeled again by a group of investors. On September 7, 1907, just prior to reopening, the most beloved of all the Cliff Houses burned to its foundation. This exquisite building had survived the 1906 earthquake only to succumb to a raging fire that destroyed it in less than two hours. The Cliff House refused to give up. . . as did its investors. 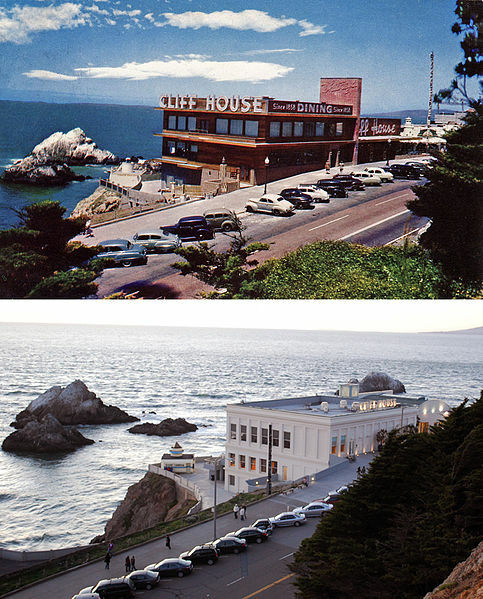 Once again, the Cliff House was rebuilt in a neoclassical design at a cost of $75,000. This third, more modest version of the Cliff House reopened on July 1, 1909. In 1918, military orders signed by the President of the United States shut down the Cliff House once again. The order stated, ". . . all establishments within a half mile of military installations are to halt the sale of liquor." Then came PROHIBITION, the death knell for liquor establishments. So, in 1925, when a 'dry' Cliff House lacked its previous draw, its owner at that time shut down all operations. In August 1938, a remodeled restaurant reopened. The site became part of the Golden Gate National Recreation Area in 1977. The steps shown in the image above may have been built in the 1920s, but I couldn't find any current information showing them now. The initial purpose was for a seawall with steps for low tide to help prevent the power of erosion. In the 1970s when they were still intact, beach goers used to sun themselves on the wide steps. With many storms, and the continual beating of the waves, erosion may have caused them to crumble into ruin, beaten by the mighty Pacific Ocean. If anyone living in the San Francisco area remembers them or knows what happened, please leave a comment to enlighten us. In the photo above, you can tell the size of the steps when compared to a human figure which is sitting on the top edge of the wall. Perched on spectacular cliffs overlooking the Pacific Ocean, the Cliff House stands as one of the jewels of the San Francisco's Golden Gate National Recreation Area. Extensive renovations to the 1909 building restored the Cliff House to its original neoclassical architecture. Some of the photographs which can be seen in the restaurant show the history of the site and more than 200 autographed photos of dignitaries and movie stars who have visited this landmark. As if to confirm that history, renovations have uncovered a marble staircase and part of the original carriage road from 1914. This is now a walkway around the property. The world famous Cliff House should not be missed if you visit San Francisco. Two restaurants are featured at the Cliff House, the casual dining Bistro Restaurant and the more formal Sutro's. The Terrace Room serves a Sunday Brunch buffet. There is a gift shop with historic memorabilia and the intriguing camera obscura* on the deck overlooking the ocean. The area immediately around the Cliff House is part of the setting of Jack London's novel, The Scarlet Plague (1912). Jack London also sets the meeting of Maud Sangster and Pat Glendon Jr. here in The Abysmal Brute (1913). Have you heard of The Cliff House in San Francisco or visited there? Do you know what happened to the old wide steps by the seawall that led down to on Ocean Beach? Do you like San Francisco? Please leave a comment to let me know you were here and I'll respond. Thanks for visiting! BTW, 'Frisco is one of my favourite cities, and very much like Vancouver, BC. Two images of the Cliff House in the 1970s by DG Hudson, and property of DG Hudson. 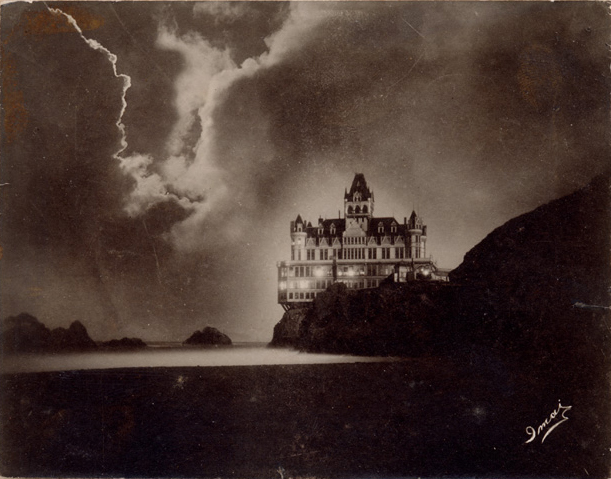 One of the most reproduced Cliff House photographs, it depct the Cliff House around 1900 illuminated by a looming thunderstorm. Image attributed to T. Imai. This work is in the public domain in its country of origin and other countries where the copyright term is the author's life plus 70 years or less. It was the blue of the biblical paintings, the only ones considered worthy of such a vibrant colour. In the beginning, that is. A Comedy D'art involving Art, Artists, and the colour bleu. Is it possible that there may have been a conspiracy involving the expensive and hard to acquire 'bleu'? OR did it have supernatural properties? 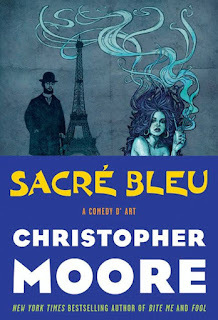 Here is one alternate history of the colour bleu by Christopher Moore. Why is blue, especially the ultramarine blue purchased from the Colorman so special? Ultramarine, a blue that captivates and seems to control at times. Many artists know the Colorman and the Woman, even when they keep morphing to fit the era. . . Anyone who touches or inhales the fumes from the paint seems to suffer in some way - from time lapses to broken relationships, but to understand how you will need to read this quirky story which should appeal to anyone who likes art. The art world isn't so sacred that it can't be spoofed. The Colorman character is a perverse, weird, rather repugnant type. He's been around for centuries. But the Woman, who usually accompanies him, can be what you want her to be, as long as you keep using the blue paint. She can help make you famous, at a cost of course. This book is part mystery, part history (alternate based on reality), part love story and highly amusing. The main character, a young baker-painter Lucien, who is joined by the dapper and diminutive Henri Toulouse-Lautrec on an investigation to unravel the 'supposed suicide' of Vincent van Gogh. They also want to find the inspiration for the Sacré Bleu colour. What gives it the special qualities? Appearing in this book are the artists who had transactions with the Colorman: Vincent Van Gogh, Édouard Manet, Paul Gauguin, Georges Seurat, Claude Monet, Camille Pissarro and Pierre-Auguste Renoir. This is the cream of the Art world in the late 1800s. There are scenarios with each artist as Henri and Lucien try to track down the colour's paranormal qualities. 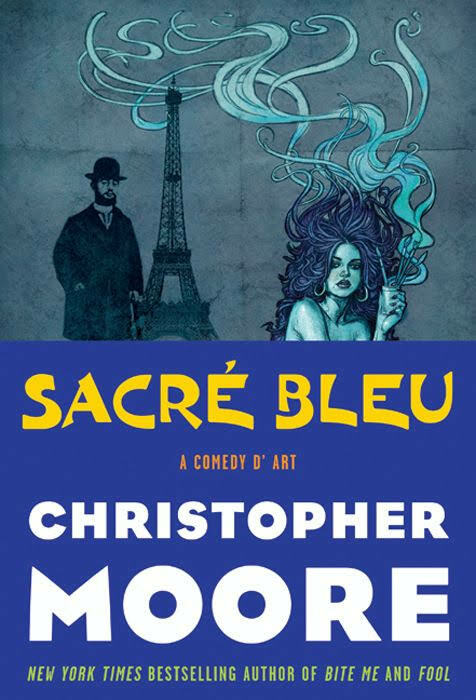 Sacré Bleu is Moore's irreverent look at the Art World, written in his usual style and highly entertaining to read. I enjoyed it and would recommend it. This book will make you think twice perhaps when you see the vibrant colour blue in a painting from now forward. I remember all the Biblical styled paintings I saw with that colour in the Louvre Museum in Paris. Hmmm. It is a gorgeous blue. . .but the only one which makes you a better painter is from the Colorman. Have you read any of Christopher Moore's writing? Have you ever read or been aware of this book, Sacré Bleu? Do you like humour overlapped with irreverence? Please leave a comment to let me know you were here and I'll respond. Thanks for dropping by! A French expression of surprise, exasperation, or dismay. It is a very old fashioned French curse, which is rarely used by the French these days. http://www.thelocal.fr/20140902/french-language-swearing-curse-words-sacre-bleu-merde Info on the term 'Sacré Bleu'. WEP - Changing Faces - What Now? All photos property of D.G. Hudson. If you'd like to use an image, contact me by leaving a comment. Theme images by RBFried. Powered by Blogger.